Location: From the city of Kamloops take Hwy. #5A south and travel for 40 km. 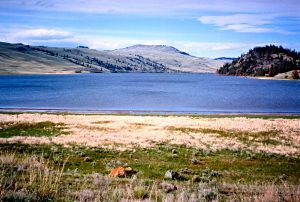 (24.8 mi.) to Stump Lake. Resorts & Campsites: 1 private campsite on the east side of the lake. There is also a public day use site and boat launch off Hwy. #5A. Fishing Report: Once famous for its huge trout of 15 lbs. or better, this moody lake still produces large fish in the 6 lb. range. Spring and fall are the best fishing months with the summer months slowing down because of heat. 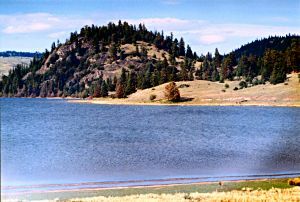 Fly fishermen concentrate their efforts at both the south and north ends of the lake, where broad shallows teaming with insect life can be found. A good damselfly hatch during early spring could provide you with your best chance to catch one of those double digit monster rainbows that still remain in the lake. Good luck landing him though. See Plateau and Peterhope Lakes.